Doug Baldwin was resurgent in his return to the field, but the Seahawks' secondary sorely missed injured safety Bradley McDougald. Seattle will have to wait another week to punch its playoff ticket. The Seahawks destroyed the San Francisco 49ers in Seattle two weeks ago. Here are three impressions from the Seahawks’ 26-23 overtime loss to the 49ers. Seattle safety Bradley McDougald missed the majority of Sunday’s game with a lingering knee injury. Undrafted rookie quarterback Nick Mullens completed 20 of 29 passes (69 percent), throwing for 275 yards and a touchdown. 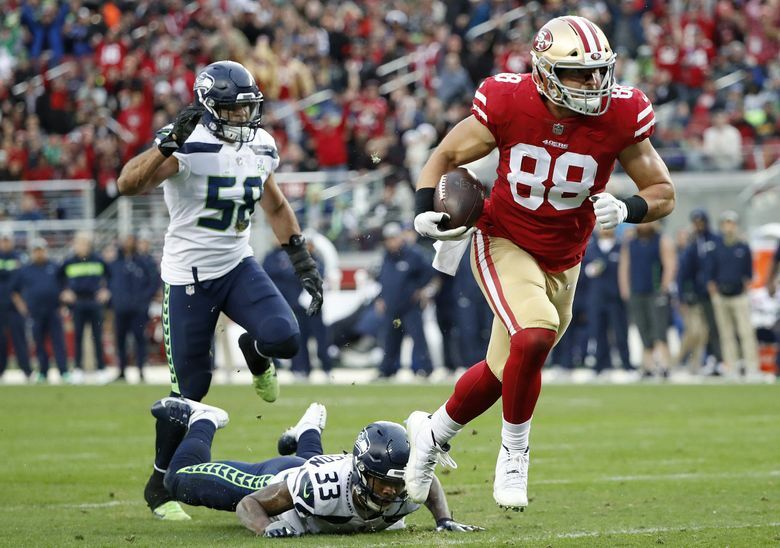 That score went to tight end Garrett Celek, who was freed after Seahawks safety Tedric Thompson slipped and rumbled 41 yards into the end zone. If this sounds somewhat familiar, that’s because Mullens also threw for 414 yards and two touchdowns against the Seahawks two weeks ago. Seattle continued to rotate multiple safeties on Sunday, as Thompson, Delano Hill and Shalom Luani all saw significant time. But regardless of who was playing, the 49ers consistently drove the football downfield. The secondary wasn’t entirely to blame, however. The Seahawks were penalized 14 times for 148 yards in the loss. Those penalties deflated Seattle drives at the end of the fourth quarter and in overtime. Russell Wilson had perhaps his worst game as a Seahawk in the team’s Monday night win over Minnesota last week, completing just 10 of 20 passes for 72 yards and an interception. It was no coincidence that veteran wide receiver Doug Baldwin also missed the game with a hip injury. The 30-year-old Baldwin — an eighth-year pro — was listed as questionable for Sunday’s game but confirmed following Friday’s walkthrough that he would play. Baldwin provided the entirety of the Seahawks’ first-half scoring, hauling in an over-the-shoulder 5-yard touchdown on the team’s opening drive before adding a spinning, diving 35-yard score late in the second quarter. He finished with four catches for 78 yards and two scores. Second-year running back Chris Carson also turned in his fourth 100-yard rushing game of the season, chugging for 119 yards and a touchdown on 22 carries. The most impactful yard came early in the fourth quarter, when Carson kept driving his legs and plowed through a crowd of 49ers into the end zone on fourth down. It was a tale of two kickers for the Seahawks on Sunday. Punter Michael Dickson continued to impress in a prolific rookie season, averaging 52.5 yards with seven punts. He knocked three of those punts inside the 20-yard line, including back-to-back punts in the first half to the 1- and 2-yard line, respectively. He also boomed a long of 65 yards. On the other side, placekicker Sebastian Janikowski turned in a disastrous five-minute stretch. The 40-year-old 19th-year pro missed his third extra point of the season following the Seahawks’ first touchdown of the game, then immediately kicked off short of the end zone. Wide receiver Richie James Jr. returned the kick 97 yards for a score, with Janikowski making as feeble a tackle attempt as you’ll ever see along the way. He also rebounded in the fourth quarter, cranking a game-tying 48-yard field goal in the rain. Cornerback Neiko Thorpe was also called for an unnecessary roughness penalty on punt coverage in the second half, adding to the special teams unit’s inconsistent day.